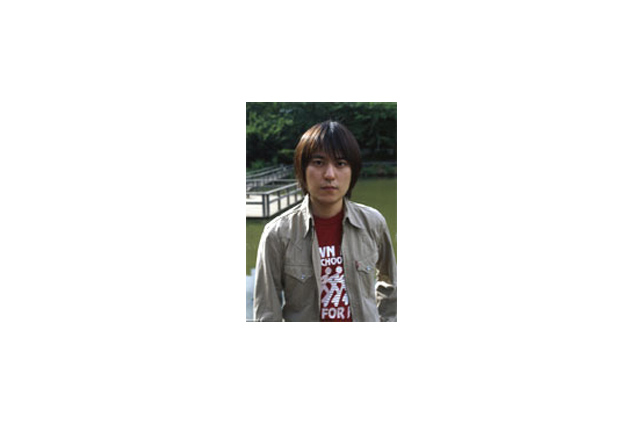 Kazuyoshi Nakamura is a Japanese singer-songwriter from Tokyo currently active in the guitar group 100s (Hyaku-Shiki). As a young boy influenced by Gogh and Marc Chagall Nakamura’s first interest was painting, though from the age of 15 he turned to music. Until the end of High School Nakamura composed with English lyrics but with no success. After graduation he confined himself to his grandparent’s home and began writing in Japanese. According to his own writings, Nakamura wished for success more than anything. At the beginning of 1995 he managed to sign with the five-d music agency, and in 1997 rleased his first single 「Inu to Neko」, ‘Dog and Cat’. He was proclaimed at the time as a genius by the noted music critic Shibuya Youichi, someone with pop sensibilities that only appear 「10年に1人」”once in every ten years”, and Nakamura gained high praise in many music magazines. To continuing critical and commercial success Nakamura’s first album 『KINJITOU』 ‘The Monumental’ was released. His sound was considered Lo-Fi with links to Beck, and popularized to some extent the idea of ‘Home Recording’ in Japan at the time. Continuing his release success, Nakamura;s sound became more ‘Rock’ and ‘Dance’-like, though staying firmly in the territory of Pop, and to date he has released a total of four original solo albums, numerous singles and a best-of collection in 2003.